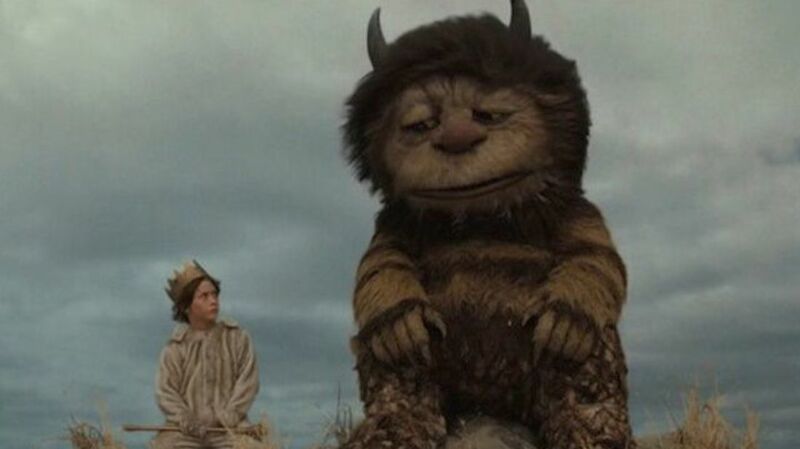 The production of Spike Jonze’s Where the Wild Things Are was famously troubled—mostly due to not one but two studios, Universal and Warner Bros., being taken aback by its darker approach to Maurice Sendak’s famous book. But the process of getting the movie made sure seemed like it was a good time: Lightsaber fights, Nerf guns, and a surprise appearance from Brad Pitt, anyone? 1. ALL THE WILD THINGS’S FACES—AND ONLY THEIR FACES—WERE CREATED WITH CGI. Opting to go the practical effects route, Spike Jonze hired Jim Henson's Creature Shop to construct the Wild Things as life-sized puppets. However, the intricate machinery required to control the puppets’ facial expressions made the suits too heavy for the performers—the heads alone weighed 50 pounds—so their faces were taken off and added in post-production using CGI. 2. JOHN LASSETER WORKED ON A POTENTIAL ANIMATED VERSION FOR DISNEY. In 1983, Disney made moves toward making a Where the Wild Things Are animated feature when animator/character designer Glen Keane (Beauty and the Beast, The Little Mermaid) and eventual Pixar chief creative officer John Lasseter created an animation test that blended traditionally hand-drawn Max with computer-generated backgrounds. 3. THE DIRECTORS OF PIRATES OF THE CARIBBEAN AND POCAHONTAS WERE INVOLVED EARLY ON. 4. SPIKE JONZE TURNED DOWN DIRECTING THE MOVIE. TWICE. Spike Jonze and Maurice Sendak met when Jonze, who at that point had not made a feature film, was attached to an adaptation of the classic children’s book Harold and the Purple Crayon, which Sendak was co-producing. Sendak actually asked Jonze to direct Where the Wild Things Are twice—once after Harold fell apart and again after the release of Being John Malkovich; Jonze declined both times, believing that the book “was perfect and there was nothing I could add to it.” In 2003, a year after the release of Adaptation, Jonze came up with the idea of the Wild Things being Max’s emotions and finally agreed to direct. 5. MAX RECORDS’ AUDITION PROCESS INVOLVED A NERF GUN BATTLE. For the role of Max, Jonze wanted someone who could be introspective but also energetic and filled with rage. To that end, Max Records’ audition process involved attacking his parents with a plastic sword, shooting a Nerf gun at Jonze while the director tried to block the foam bullets with an umbrella, and fighting with Jonze while they both wore giant inflatable boxing gloves. 6. IT’S BASED ON A BOOK AND THERE’S A BOOK BASED ON IT. Where the Wild Things Are just might have the most highbrow based-on-the-movie novelization ever; noted author Dave Eggers (A Heartbreaking Work of Staggering Genius) wrote the script for the film with Jonze, and adapted it into the novel The Wild Things, which memorably came out in a fur-covered edition. 7. JONZE’S DIRECTORIAL DUTIES INCLUDED FIRE-SWALLOWING. In order to get the appropriate shocked response from Records during one scene, Jonze practiced fire-swallowing—which he learned from Catherine Keener—behind the camera. It was less than successful, with Records recalling that the director “burned the roof of his mouth pretty bad.” Some of the Wild Things would also engage in lightsaber fights off-camera. 8. JONZE’S JOB DESCRIPTION ALSO CALLED FOR HIM TO PRETEND TO BE AN OWL. 9. MAX WAS ORIGINALLY PLAYED BY BRAD PITT. 10. RECORDS TOOK REVENGE ON JONZE FOR THAT UNCOMFORTABLE STOMACH SCENE. In retaliation for the scene where Max, covered in goop, emerges from the stomach of KW, Records made Jonze promise he could cover the director in the stuff, too. “He was so happy and I was miserable, so it was a good retribution,” Jonze recalled.